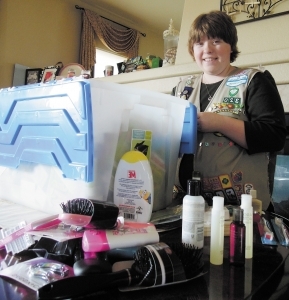 Nelly Grantham from Thornton sorts through a bin of personal hygiene products. The Horizon High School senior recently earned her Gold Award, which is the highest honor for a Girl Scout. For her Gold Award project, she gathered 6,000 personal hygiene items that were donated to Westminster nonprofit Growing Home. Photo by Ashley Reimers. Nelly Grantham’s Girl Scout vest is covered with badges, symbolizing achievements and work done since the first grade. Her accomplishments don’t end at badges though. The Horizon High School senior’s most recent accomplishment is earning her Gold Award, the highest honor for a Girl Scout. The Gold Award is not mandatory and this year just 50 Girls Scouts earned the honor. Girls who choose to earn their Gold Award must: identify an issue, investigate it thoroughly, get help and build a team, create a plan and present a plan, gather feedback, take action, and finally, educate and inspire others. The project takes at least 80 hours to complete. Grantham, 18, began her journey in August 2013. Since then she’s been collecting personal hygiene items for homeless families and those in crisis at Growing Home, a Westminster nonprofit organization. Grantham is mentally and physically disabled, but that didn’t stop her from collecting over 6,000 items. You purchase anything and we get a percentage of everything you buy.